This Easter I decided to make little yarny gifts for the children in my family to accompany their chocolate Easter eggs. For the girls I made them little bunnies as featured in previous posts (click on the bunnies to take you to the relevant post). For the boys I wanted to make them something a bit quirky. 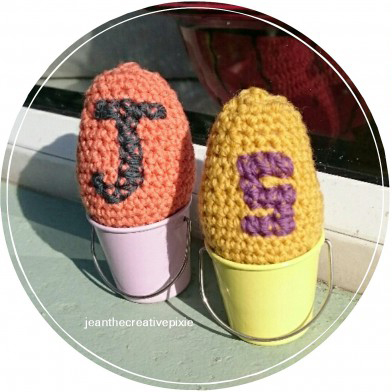 I found a pattern for some crochet eggs on the Toft Alpaca Shop website. 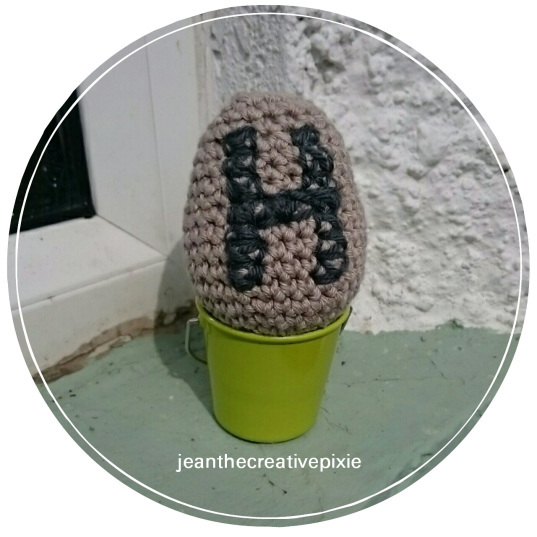 Once they were made I thought that I would add some personalisation by sewing on each boys initial to their own egg. For my nephew Charlie, his mother (my sister), had requested I crochet something she had seen I had pinned on Pinterest. It was a crochet minion granny square from Repeat Crafter Me. Here’s my finished square (unblocked). This pattern was simple to follow and the block was surprisingly easy to make. The only difference is that instead of using a black button for the eye I crocheted a black circle. Now the plan was to make the block into something so I asked Charlie if he’d like it made into a little cushion or a blanket and he said no that he liked it as it was. Well lucky me that’s saved me a lot of work and he has ended up with a gift just as he wanted. I love the eggs. I am working on crochet food for a day care. So sweet, and Charlie is a typical child, no fuss-muss…He loves his square as is and it’s something he’ll always have from his loving aunt. 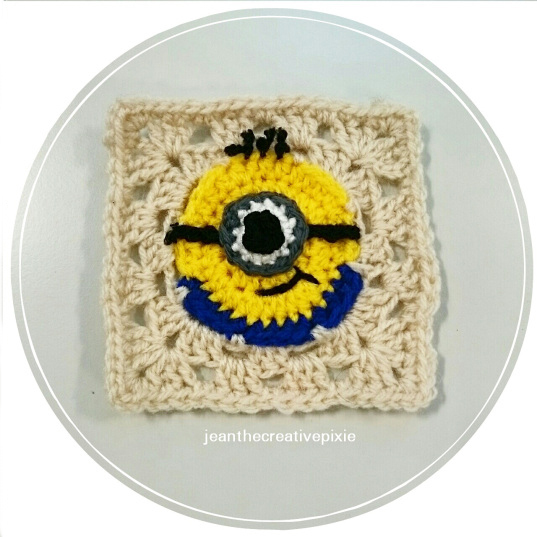 Wow I need to make the minion square… I feel the need for this pattern… I haven’t been so excited about a granny square since I made hello kitty ones!!!! Hello Kitty squares!!!! Did you blog about it, if you did can you share the link? Thanks, my girls love Hello Kitty.